Last night was the boys club lock-in at church. It is a crazy affair, kind of a disney-world end of year event for the clubbers. It used to be held at the YMCA in Greenfield, but it got to be that the numbers dwindled so much that they had to scale back. There were probably 55-60 boys in attendance, a dozen rangers, and a dozen dads. It was an absolute blast, even as a full grown adult. (The boys liked it too). The night started with a prayer and some ground rules. From there, I was dismissed to get ready to oversee the fishing event down in the baptismal pond. It was nice that way because in years past I was released at the same time as the kids, so had to frantically bait 8-10 hooks while kids waited. This time I was able to get a jump and have all the lines set up and baited by the time they got down to the pond. I even got to cast a line out for 10 minutes alone. I Didn't GET anything, but hey, I wet a line. 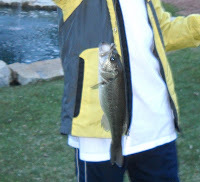 It was as crazy as in years past, but at least this time the boys were catching fish. We must have hauled in 20 fish in the hour and a quarter that we were out there. 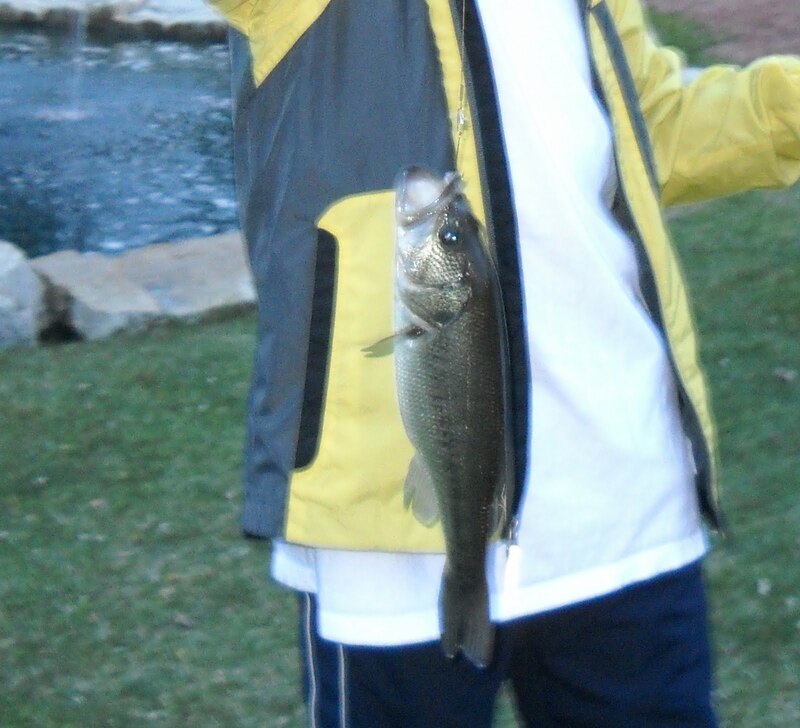 This included the catch of the night, a 11 inch largemouth bass. It was a sweet fish, one that would have made for good eating if we had decided to keep any. We caught and released all fish though, and near as I saw, ended up killing none. From there I went indoors and played a few games of what is known as "pillow polo". What it really is though is club hockey, or hockey with clubs. Granted the clubs are padded sticks like the marines use in their hand to hand combat training, only single sided. The ball is a foam ball about the size of a volleyball and the goal is to bash it into the other teams goal using your club. Now I don't know how you can sugar coat a hockey game with clubs by throwing the word pillow into it, but I do know that it is crazy fun. What's really interesting is when the ball gets airborne and the boys take to swinging their clubs like baseball bats. It's downright frightening at times. How no one got brained during the course of the night, I'll never understand. Crazy fun though. At about 8:30 we broke for a dinner of Toppers pizza and lemonade. We went from there to story circle where a childrens pastor from Kenosha spoke about worry and trust. He was engaging and kept the kids attention, in part using a "vote with your feet" demonstration. The kids had free time after that, so I helped referee the 3-0n-3 basketball tournament that Ben was in. He played up against 3 6th graders, so they took a pretty bad beatin'. I was proud of his fierce play though, actually have never seen Ben try so hard. Something about the fact that he's 1/3rd not 1/5th of a team made him kick it up a notch. From there to too-big ice cream sundaes. It was just one good thing after another. After we'd eaten ourselves sick, what better way to work it off than an hour of Dodge Ball? It was sweet. Of course I am absolutely lame today and feel like I'm 70 years old, but it was worth it. There's something so primal about bearing down on a smaller individual with a foam ball thrown as hard as humanly possible. What's with that? I don't know what comes over me, but it's all rage, baby! Totally harmless in most cases. A couple of kids got hit in the "gentles", but because they were hyped on the adrenaline and primal rage, they often weren't on the sidelines for long before they were heaving with zeal again. I think there's probably dodge ball in heaven. Maybe no head shots allowed there though. We closed out the night with a game of sharks and minnows in the gym. Every boy there was exhausted and sweaty, and most had the time of their lives. Its really a great thing to be a part of . I'm grateful for my chance to have taken part in Boys Club over these past four years. I know it's incredibly unorganized at times and I am forever complaining about it, but it's only because I love it and want it to be better. My co-ranger feels the same way and is actually committing to taking on a leadership role next year in hopes of making it better. This morning we were forced to watch Ben's soccer game in a driving rain. He and the rest of the team battled it out and ended up in a 2-2 tie. I was amazed at the effort those boys gave despite the weather. Us adults could learn some lessons from the way these kids tuned out the weather and focused on the task at hand. We so often shelter ourselves away, afraid that we might melt if we get wet. Went and learned about rain barrels/rain gardens this afternoon and from there to Gander Mountain to get line for my reels and a few Husky Jerks (buy 2 get 1 free!) It's the second week in a row that I've been at Gander Mtn., so I figure I NEED to get fishing soon. I'm jones'n. Tomorrow brings a movie and food with friends and a workout for me. I love weekends.